There’s no other way to say it: Ticks are gross. They can also be dangerous. They’re known to cause a number of health issues, from minor irritation to red meat allergies (what?!) to full-blown joint problems and debilitating neurological conditions. In addition, some tick-borne diseases can be fatal. Unfortunately for everyone who doesn’t want a tick attached to them (that’s probably everyone reading this), these little bloodsuckers are going to be pretty widespread this year. According to a study published this month in the Centers for Disease Control and Prevention’s Morbidity and Mortality Weekly Report, cases of disease from mosquito, tick and flea bites has more than tripled in the United States — with more than 640,000 cases of these diseases reported from 2004 to 2016. So, here’s what you need to know about ticks, from why there are so many to how to deal if you find one attached to your body and when to seek treatment if you get sick. Why will this be the summer of the tick? Ticks are hardy little buggers, and to the detriment of us all, they’re slowly expanding their geographic range. According to Dr. Nancy Troyano, an entomologist and director of technical education and training for Rentokil Steritech, ticks’ normal hangout spots are closer than ever to humans and other hosts, which increases our chances of running into a tick. Also, the weather may be playing a part. “We have had mild winters with a few extremes and have not had many deep freezes, which would typically control tick populations,” she tells SheKnows. Another factor is tick hosts and how their populations are booming, particularly white-footed mice, whose numbers have also been boosted by recent mild winters. Where do you encounter ticks? Of course, keeping ticks off your body in the first place is a good idea. First of all, avoid wooded and brushy areas that feature high grass, weeds and leaf litter. 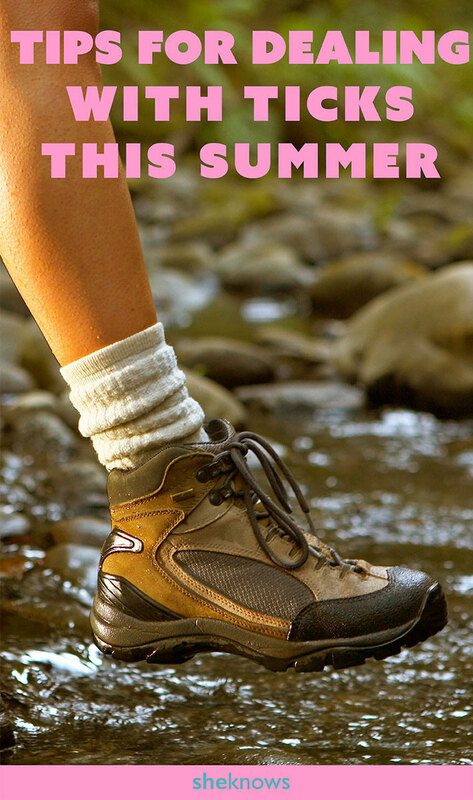 Walk in the center of trails too to keep contact with tick-infested areas at a minimum. Light-colored clothes can help you spot a tick easier than dark threads, and tuck your pants into your socks to keep them from crawling up your legs (eek). Sunny, open areas are best to frolic in, as ticks aren’t keen on the sunlight, and keep away from shady areas with low-lying plants and shrubs. Also, do a full-body inspection after being out in the great outdoors. Since most ticks work their way onto our bodies from the ground up, start with your feet, legs and groin areas. Ticks can also hide in belly buttons, ears, armpits, head hair and just about any nook and cranny you provide, in addition to your front, back, bottom, top and everything in between. You have a tick — how do you remove it? If you’ve found an attached tick, resist the urge to pluck it off with your fingers. Instead, grab a pair of tweezers or forceps and grasp the tick as close to your skin as possible. Pull straight out, removing its head in the process. Wash and dry your tick bite, and resist the urge to immediately chuck the tick into your garbage. Save the tick instead in a sealed plastic bag or vial in case it needs to be identified if you develop symptoms later down the road. Not every tick bite needs medical attention. However, there are serious illnesses that can arise from a tick bite, so contact your health care provider as soon as possible if you develop symptoms such as a fever, rash or joint pain. 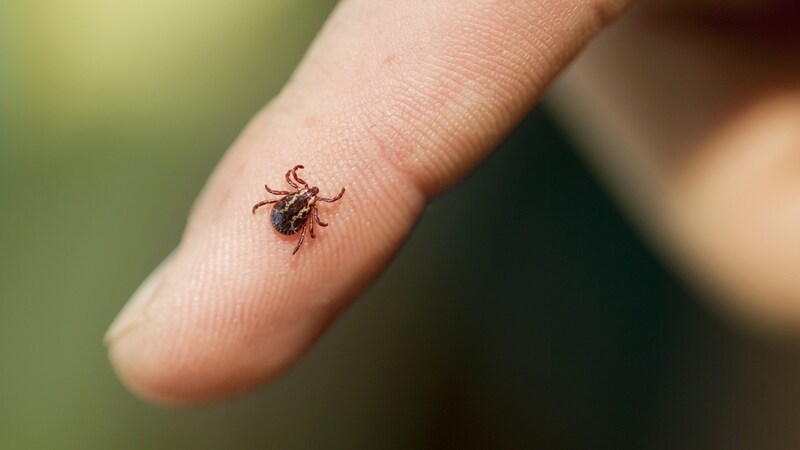 “Symptoms of tick-borne illness typically occur within a few days to a few weeks after a tick bite,” says Troyano. Also, a bite from a Lone Star tick can result in a red meat allergy, which can be life-threatening, so if you develop symptoms such as hives, stuffy/runny nose or nausea, seek help; and if you’re experiencing a severe allergic reaction (including trouble breathing, facial or tongue swelling or low blood pressure), you’ll need immediate medical attention.